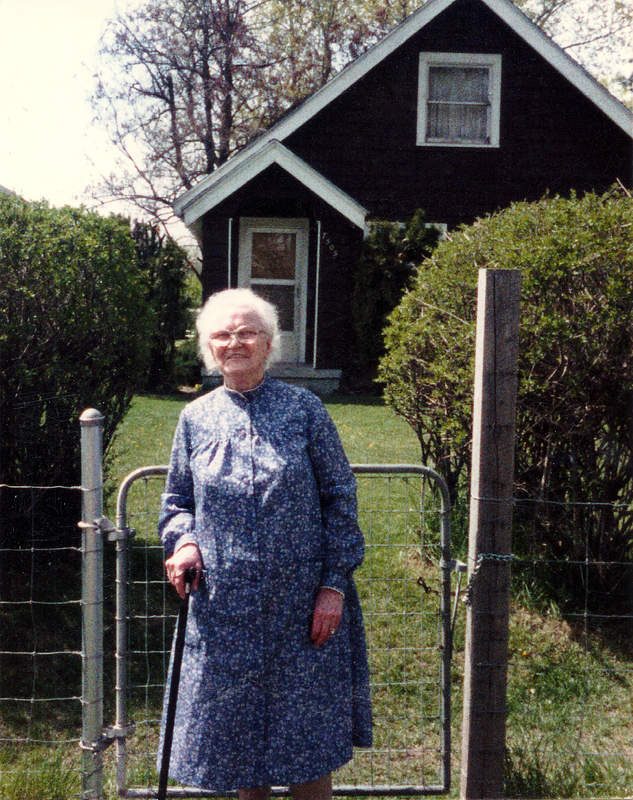 Mary Brown Young Costello, April 1988 in front of her home on Regal in Spokane, WA. That photo up there is my spunky great grandmother Mary Brown Young Costello. She was born in Scotland and at the age of seven she, her mother, and her three living siblings left Scotland to join their husband and father in America. Ancestry.com. Border Crossings: From Canada to U.S., 1895-1956 [database on-line]. Provo, UT, USA: Ancestry.com Operations, Inc., 2010. Original data: Records of the Immigration and Naturalization Service, RG 85. Washington, D.C.: National Archives and Records Administration. You can see Catherine Young, age 36, with her four children Catherine, Mary, Alexander, and George. As it turns out I wasn’t nearly as curious about this record as I should have been. I made three big rookie mistakes – at first. Mistake one – I found this and quit looking for other travel documents. Mistake two – I thought this was the whole record. Mistake three – I didn’t read the whole page. Mistake one – Later, I had gained more knowledge and learned that there could be multiple travel records. I needed to look for records from the port they left, the port in which they arrived, the Ship Manifest, and the Border Crossing record – they arrived in Quebec and crossed from Canada to the US. Not to mention there is the possibility of a passport application, a passport, a naturalization record and probably others I don’t know about. Each of those records has the potential to add new information. Lesson: Don’t quit looking when you find record number one! I’ve gone on to find two more so far. On page one, Catherine is listed on line 18, she is also on line 18 on page two. On this page we learn that Catherine was traveling with $500 and that her passage was paid by her husband. She and her children were traveling to James Young who was living at 829 Placer Street in Butte, Montana. And here is where mistake number three comes in. Let your eyes glance upward and see that whoever is listed on the line above Catherine is traveling to her cousin James Young living at 829 Placer Street. What now? I noticed that little fact a few YEARS after I originally found this record because I didn’t click to page two and I didn’t read the entire record. Lesson: ALWAYS check for a page two, and three and so on. Read the ENTIRE record. She had a ticket that she paid for herself. She was either traveling with $100 or $1,000. You could convince me of either. She had never been to the US before. She was joining her cousin James Young who lived at 829 Placer Street in Butte, Montana. She answered no to the next several questions – she wasn’t a polygamist, anarchist, cripple and so on. She was 5’7″, dark complexion, brown hair, blue eyes, no identifying marks. She was born in Clydebank, Scotland. Once I had read through the record, I was completely stumped. I had no Maggie Douglas in my tree. No D J Muir in my tree. No idea how Maggie and James were related. Where on earth to start? I was faced with doing exactly what PastSmith was talking about – I was being forced to start midstream. Great advice. I also had no idea for a long time that I should click through to the pages before and after certain documents. The first time I did it was with a passport application. I saw a picture of an unrelated person on the left side of my grandfather’s passport application and thought, “Hmm, maybe his picture is on the next page, left side of someone else’s passport application.” And sure enough—there it was! Since at that point I had only one photo of my grandfather, I was very excited. That is a wonderful find! So glad you noticed the other photo and clicked to the next page!! Oh goody. *claps hands in glee! * Yet another mystery with all sorts of interesting clues. These are the things that keep my up at night! Can’t wait to read part 2. What do you mean, to be continued?!!!! Come back! Good advice, indeed. Aren’t these mysteries fun? They niggle at you, maybe torment you, get you digging and searching. I love genealogy. Looking forward to part 2. Thank you Linda! I’m glad you enjoyed it. Thank you for sharing it on your list.